Walbaum is a modern serif typeface created by Charles Nix together with Carl Crossgrove & Juan Villanueva and published by Monotype which is available in 69 fonts, 5 widths (06 PT, 12 PT, 18 PT, 60 PT, 96 PT) each with 10 weights (from Thin to XBlack) and italics, over 600 glyphs, useful Open Type features, ornaments & frames, rules & braces and repeating ornaments. It is ideal for typographic use, book, display, magazine etc. For more details you can use a guide which is available in PDF format. Enjoy! Price: starting from $49 for one font to $199 for all 69 fonts. 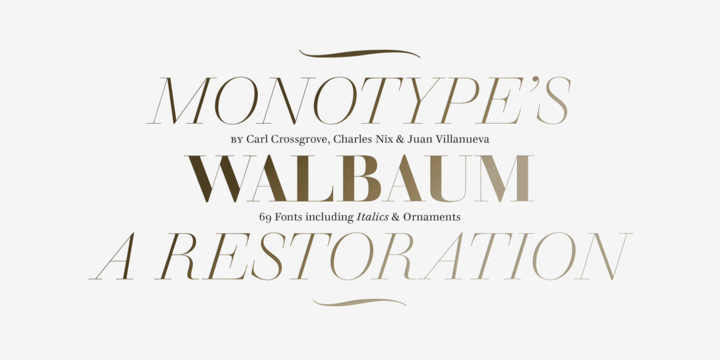 A font description published on Tuesday, July 3rd, 2018 in Carl Crossgrove, Charles Nix, Fonts, Juan Villanueva, Monotype by Alexandra that has 1,878 views.